Supreme Sleep Positioner Discounts Apply ! The Supreme Sleep Positioner offers a comfortable, one-piece design with a removable and washable cover. 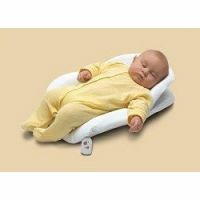 The soft, jacquard cover is warm in winter and cool in summer and allows maximum airflow to keep baby from over-heating. Three heart beat modes (including a 'listening mode' that turns on the heart beat sounds when your baby cries) help to offer your baby soothing comfort all night long. *This item will ship via FedEx ground and may be shipped separately from other items in your order.